Neda Aria, a former journalist, a freedom fighter, a researcher in the field of gender studies and a writer by heart has written 10 novels in Persian, numerous poems, and short stories and working on her current 3rd novel in English. Some of her favorite titles among her written pieces are “A Chat with Blood”, “We Lost the Train”, “Starless Nights”, “The Sin of Sodom”, “IDEO: The Bitter Recipes of the Truth” and “ENARO”. She is the second winner of The Webby Awards in 2004 -2005 for her blog and her short story “Where is the elephant?” won the 2006 Book Awards of Iran Cultural Fairs Institute (ICFI). In her books, she blends her two-decades-old passion for writing with an everlasting interest for psychological, political, and dystopian fiction and sci-fi. 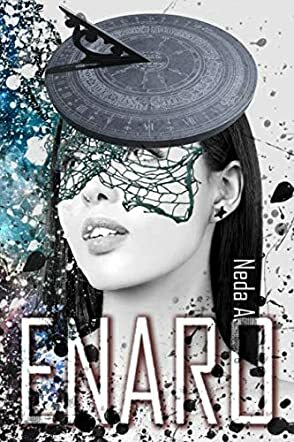 Enaro by Neda Aria is a great achievement for a debut novel and a riveting entry in the genre of science fiction. Set in 2022, in a society that "has been shaped when ownership lost its meaning and consumerism failed humanity," the reader is plunged into a world where religion defined identity, not financial institutions. But the beauty of this society has lost its meaning for one man — Kes. A virus outbreak attacks women — born and unborn — and a powerful entrepreneur comes up with something new but with unthinkable pitfalls. Survivors of the virus will need to undergo an inoculation to be admitted into five NERO buildings around the world. But is everyone made for this kind of opportunity? One person is out to uncover the whole truth. Can Kes rise up against evil when it threatens to destroy an entire people? I loved the voice of this author right off the bat and her power to describe scenes and bring to life the world within which the narrative takes place. We encounter Kes, a character that readers will quickly get to like at the opening of the story: "His face was reflecting in the metal. His wet eyes carried a weight of sadness. The metal reflected a golden light on his white stubble. Numb and wan of thoughts, he was incapable of any facial reactions." Neda Aria creates a story with powerful conflicts and an underdog for a protagonist. The writing is fluid, punctuated by interesting dialogues, and focused scenes. While the setting is in the future, the story is permeated by a strong sense of realism, thanks to the author's gift for exploring human emotion in her craft. This is a story that will find a good home with fans of science fiction. Enaro is a thrilling and thought-provoking work of science fiction penned by author Neda Aria. Written in a conspiratorial style, the story takes us on a mysterious journey as our central character searches for the grim truth behind a seemingly perfect utopia: the NERO buildings. When a terrifying virus begins to target female humans, survival becomes key, and the hugely powerful Geras offers salvation, but only for subjects who pass his NERO tests. Our hero, Kes, is an apathetic soul who looks at the new world with a skeptical eye, but he may be the only one capable of rising up against Geras and finding out what the seedy entrepreneur is really up to. Both surprising and satisfying, Enaro was a book which I enjoyed from start to finish. There’s something very similar to George Orwell and Aldous Huxley about the set-up of the proposed perfect future world, and the promise that the luxurious NERO buildings offer to those ‘lucky’ enough to get in. Author Neda Aria draws some really interesting parallels with today’s society with regard to the treatment of women, the apathy of modern human life and the idea of elitism when it’s given too much power. As well as this, the prose and dialogue of the piece give further emotional depth, making it both a strong character-led piece and a cleverly conceptual work of plot. Overall, Enaro is certain to please fans of the traditional masters of science fiction, but it also seeks to update the ideology for the modern and postmodern day.